After a new round of states voted Tuesday, Texas still had the second lowest voting-age participation rate of all that have held both Democratic and Republican primaries so far, behind only Louisiana. Texas pulled in more than 4.2 million voters in its March 1 primaries, the most in state history, according to the secretary of state, but that number accounts for only 21.5 percent of residents 18 and older. Louisiana, with 17.3 percent of their voting-age population casting ballots, was the only state of the 19 that have already voted with a lower voter turnout rate than Texas. Louisiana, unlike Texas, uses a closed system for presidential primaries, where a person must register as a Democrat or Republican before the election to be eligible to vote in a primary. In Texas, voters can decide at the polls which primary to vote in; no prior party registration is required. Recently, President Barack Obama and Gov. Greg Abbott have given opposing perspectives on voter turnout in the state. “The folks who are governing the good state of Texas aren't interested in having more people participate,” the president told The Texas Tribune’s Evan Smith last week at South by Southwest Interactive. Obama has criticized voter ID laws in the past, like the one Texas passed in 2011. The law requires most citizens to show an allowable form of photo identification, like a state driver's license or handgun license, before their ballots can be counted. Last year, a federal judge ruled that the law had a “discriminatory effect,” restricting voting access for black and Hispanic Texans. The U.S. 5th Circuit Court of Appeals announced earlier this month that it would hear arguments over whether the law violates the Voting Rights Act. “We don’t want to open the system up to methodologies or ways of voting that would promote or allow voter fraud,” Abbott said. There were 104 cases of alleged voter fraud in Texas between 2000 and 2011, according to a study done by News21, an investigative journalism project at Arizona State University. That's fewer than three cases of alleged fraud per 1 million votes. Five states held primaries Tuesday: Florida, North Carolina, Ohio, Illinois and Missouri. Ohio had the highest turnout, with 35.2 percent of the voting-age population casting ballots, according to the state. The lowest turnout of the day was Florida, at 25.6 percent, 4.1 percentage points higher than Texas. Florida, like Louisiana, has a closed primary system. When accounting for the voting-eligible population, an estimate that excludes undocumented immigrants and felons on probation or parole, Texas still ranks second to last. 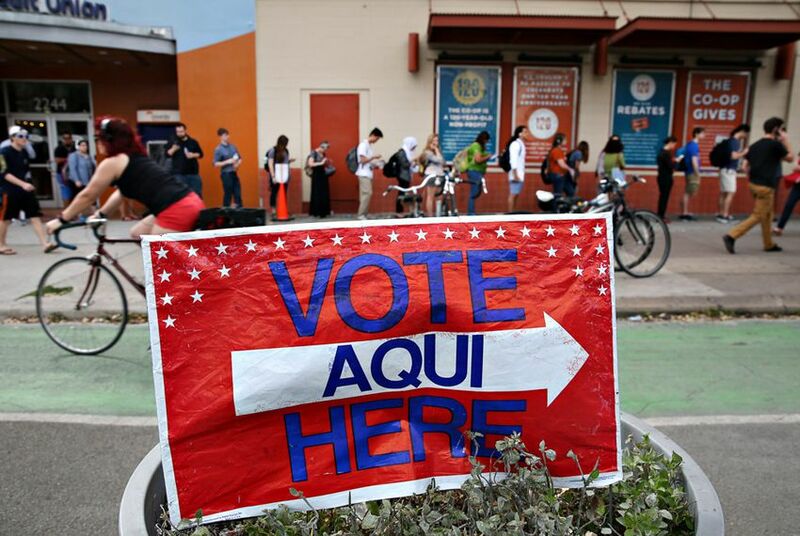 On March 1, 24.7 percent of Texas' estimated voting-eligible population cast a ballot. Ross Ramsey and Jamie Lovegrove contributed to this report.